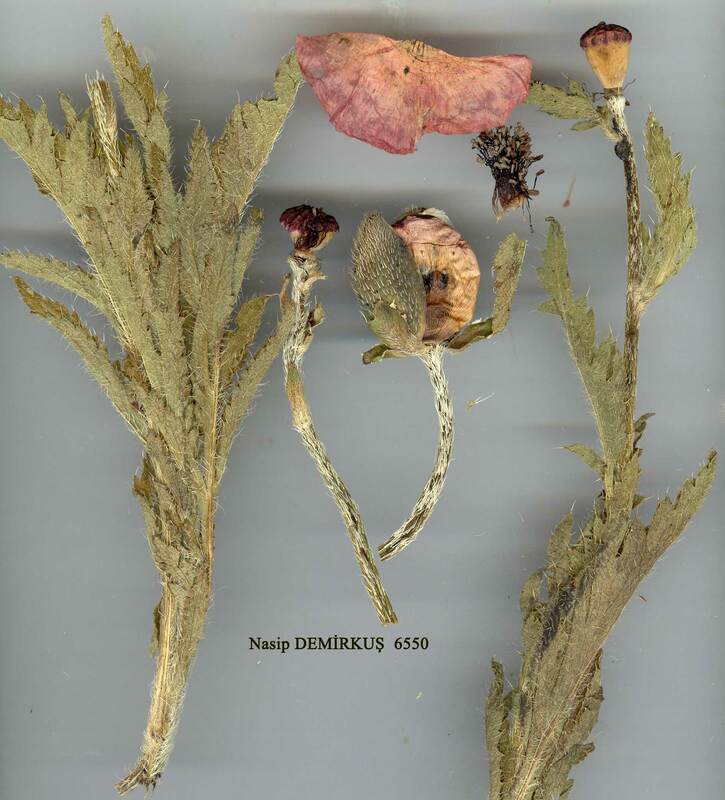 P. bracteatum Lindl., Coll. Bot,, ;:. 23 (1821). 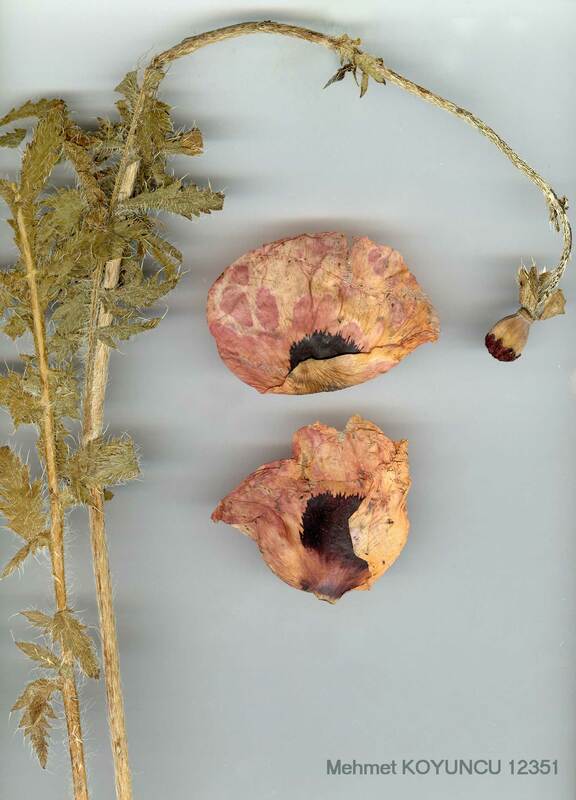 Figure 8, p. 223.
flowers conspicuously bracteate, petals purplish-crimson, with a black blotch 'longer than broad, and obovate-globose capsule with 14-20 stigmas. Fl. 6-7. Rocky slopes, etc., 2000-2500 m.
Described from specimens cultivated in London. E. Anatolia. A8 Erzurum: Kop Da., Bayburt to Aşkale, 2050-2100 m, Hub.-Mor. 13944. A9 Kars: Kars, Lagovsk. 35 Kayseri: Ercias Da., Bornm. 1951. B6 Sivas: SE of Ulaş, Reese! B7 Erzincan: Kara Da., 1960 m, Hub.-Mor. 13943! B8 Erzurum: Erzurum, Calvert! B9 Van: N of Çatak, D. 22985! B10 Ağri: Ararat (Büyük Ağri Da.) Baiern. C5 Niğde: Pertek, Andirmussan Da., 2000 m, Siehe 402! N. & N.W. Iran, Caucasus. In Turkey only in the Ir.-Tur. region. 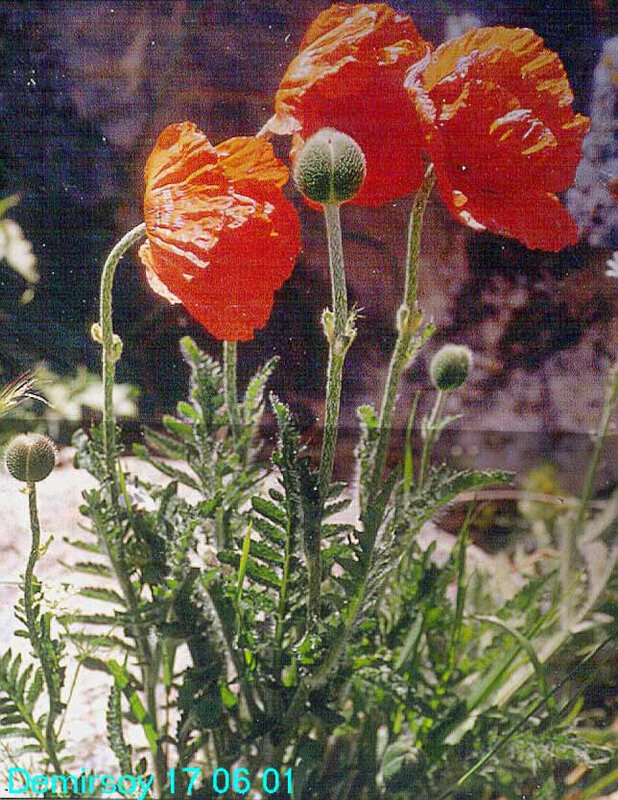 Both this and the previous species are widely cultivated as garden ornamentals, usually under the name P. orientale; every transition occurs between them.